And yet as we grow up, although we clearly view gratitude as fundamental, we often forget. Working at Senator Kohl’s office, I had a deep appreciation for the work everyone was doing, but I didn’t always remember to tell them. 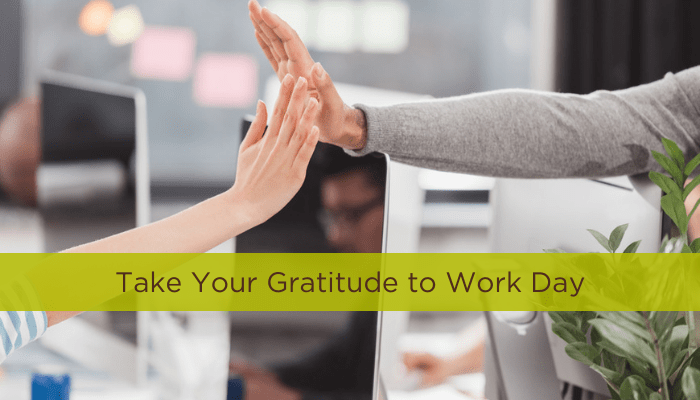 It’s easy to take people for granted, especially when there is a large staff and an overflowing workload of never-ending emails, meetings, and other distractions that get in the way of expressing gratitude. As I did more research and work on team building and coaching, I kept being reminded of how important it is to continually express your gratitude to those working with you. Now that I have a team of my own, I make sure to continually thank them for their part in the success of DLCC. I know I couldn’t do it without them, and I tell them so regularly. Sometimes I do it verbally at team meetings, other times through an emailed note of appreciation. And for an extra special thanks even with a gift (last year was quarterly wine shipments for everyone!) or a celebratory event! While gratitude is partly about helping people feel good, it also boosts morale and engagement. This helps increase productivity and improves company culture. One of the keys to employee engagement and happiness is a sense of purpose at work. So it is essential to help remind people of the important role they play in your overall strategy, and thank them for doing it! It can be easy for people to lose sight of how they are contributing to company success, but if you can remind them, they will feel more connected to your mission. It can be especially important to thank those who have small roles since they are often overlooked. The good news is that often a simple thank you will do. But if you are interested in digging deeper into the various ways we can appreciate people at work, I highly recommend the book The 5 Languages of Appreciation in the Workplace: Empowering Organizations by Encouraging People. It even has some great insights into understanding how to express your gratitude in a way that is meaningful to others. This is a time of year where we get a lot of reminders to be grateful for what we have. Be sure not to leave all your gratitude at the dinner table (or with your toddlers), and tell your work people that you appreciate them! They’ll thank you for it.